Munich, Germany - Royal Philips Electronics (NYSE: PHG, AEX: PHI) will present a range of new and ground-breaking solutions, designed to demonstrate how innovation in patient-centered care is currently helping to transform cardiovascular disease management, during the 2012 Congress of the European Society of Cardiology (ESC) in Munich. This year, Philips will introduce EchoNavigator*, which uses a breakthrough technology that provides a new dimension to interventional imaging by combining two live modalities - X-ray and echocardiography - to unite operators and images in an interactive and intuitive way for catheter based Structural Heart Disease (SHD) procedures. EchoNavigator is developed to address some key challenges faced by clinicians; as well as managing to improve team communication, during complex catheter based SHD procedures. It will enable clinicians to perform the procedure efficiently by providing intelligently integrated X-ray and echo images in one view as well as ease of system navigation, saving valuable time and improving patient care. Philips will showcase its new AlluraClarity family**, the first x-ray system with the revolutionary ClarityIQ technology. AlluraClarity IQ offers industry-leading image quality, equivalent to the Allura Xper generation, at a fraction of the dose during coronaryographies. These improvements will not only significantly help improve diagnostic effectiveness, but will also ensure that patients and hospital staff will experience fewer complications from radiation exposure. 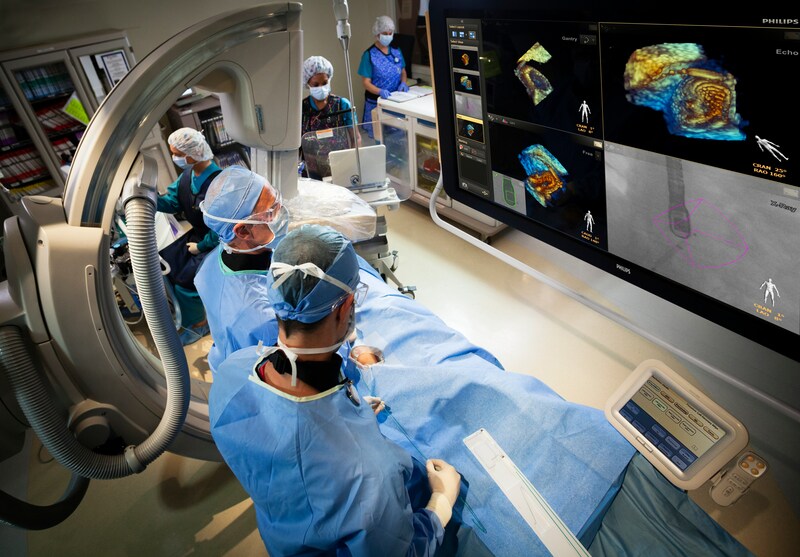 The Philips IntelliSpace Cardiovascular, to be previewed in Europe for the first time at ESC 2012, is a new integrated portfolio of software and services designed to help streamline clinical workflow and improve operational performance across the cardiovascular service line. The streamlined solution addresses clinicians’ needs for consistently managing the workflow, including clinical and administrative records for the cardiovascular service line. The solution offers one access point into consolidated patient data, advanced clinical applications, multimodality images and reports through the patient cardiovascular care continuum. The product is not yet available for sale. In addition, Philips is welcoming clinicians from around the world to join its unique Cardiology Leadership Dialogue, in the form of nine expert-led clinical roundtable discussions. These discussions will provide a forum and opportunity for clinicians to communicate with many of the most eminent members of the cardiac care community, seeking to address some of the most essential questions in cardiology today. Topics of the discussions will range from improving STEMI and non-STEMI diagnosis and treatment, to the transcatheter treatment of valve diseases. * EchoNavigator is anticipated to be CE marked in Q4 2012. ** Not available for sale in the U.S.
Royal Philips Electronics (NYSE: PHG, AEX: PHI) is a diversified health and well-being company, focused on improving people’s lives through meaningful innovation in the areas of Healthcare, Consumer Lifestyle and Lighting. Headquartered in the Netherlands, Philips posted 2011 sales of EUR 22.6 billion and employs approximately 122,000 employees with sales and services in more than 100 countries. The company is a leader in cardiac care, acute care and home healthcare, energy efficient lighting solutions and new lighting applications, as well as male shaving and grooming, portable entertainment and oral healthcare. News from Philips is located at www.philips.com/newscenter. [iii] A Philips clinical trial study conducted together with Radboud University Nijmegen Medical Centre, Nijmegen, Netherlands.